The apple tree spoke and revealed the secret in its roots! A truly beautiful story was revealed a few days ago outside the church in Valsamata, Kefalonia. On Friday, 20 June 2014, the church of Valsamata had the first Paraklesis for St. Irene, the head nun of the Chrysovalantou monastery. “The locals embraced the remarkable discovery of the buried icon which blesses and makes holy the area of Omala in Kefalonia,” the priest of the church said, while the church council member Mr. Dimitris K. describes the prophetic dream … [ in which he had visions of the back of the church where there icon was found for four days in a row until the icon was discovered –editors note ]. Many theories have been developed about how and why the icon was buried there. It is most likely that in the past, there was a longing for a pilgrimage to the Chrysovalantou monastery, maybe someone took the icon from there, transported it to Kefalonia and for some personal reason buried it. 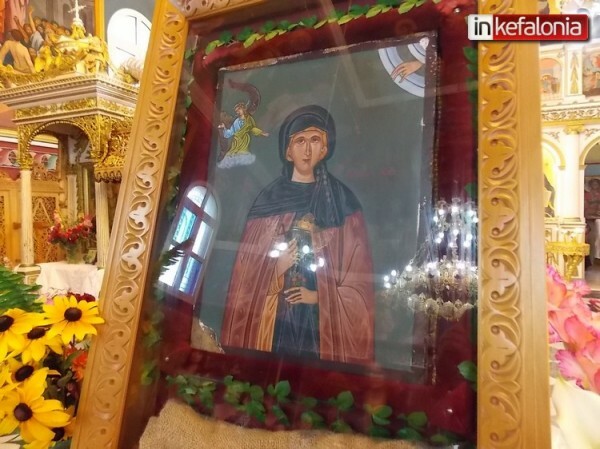 The icon of St. Irene of Chrysovalantou and the apple tree blesses with its grace the holy church in Valsamata. Be sure to visit the original article. Even if you can’t read Greek, there are beautiful photographs and a video that you can enjoy. OCN has produced a short video invitation to come to church for Pascha.